inFORM Decisions is dedicated to creating innovative solutions to help clients get more from their IBM i systems. Eliminate costly pre-printed forms and checks with laser printing on plain sheet paper with duplex printing supported. Reduce distribution costs with automated delivery by email, fax, and/or print or for indexing and storage in a Web-based archive for easy browser-based retrieval, 24×7. Include scalable bar codes, graphics, signatures and colored text. Positive Pay is an electronic process by which companies and banks can mutually increase their level of security to an organization’s check printing process. Define complex rules for bursting and processing spool files by individual page. Intelligently sorts, re-bundles and delivers spool content to individual targets for custom distribution. Along the way, spool file attributes may be overridden, and individual pages of the report or business form may be burst, sorted, grouped, bundled and ultimately directed to a target, which can again be redirected. Convert and distribute spooled files in popular formats such as PDF, Excel, HTML, ZIP, RTF and more. Streamline workflow with automated distribution by email or posting to file servers. Extract data directly from your IBM database files and output directly into Excel and PDF files. Create custom queries for one or more files. inFORM Decisions has been a Document Automation provider specializing in state of the art Document Automation solutions for the IBM i – iSeries – AS/400 arena since 1994. We believe that the IBM i/Power Systems will be relevant for a long time offering the stability and security that you’ve come to expect from IBM. inFORM Decisions is committed to the IBMi platform forever! Call (800) 858-5544 / (949) 709-5838 or visit us at www.informdecisions.com for more information about our acclaimed iDocs suite of IBM i products. Leveraging the most out of your resources is a fundamental practice for successful managers and organizations. However when it comes to managing the flow of documents the actual practice can become distorted, failing to take advantage of many unexposed benefits. Reasons for not maximizing and making the most out of document flow ranges from lack of initial training; short comings in initial planning; unfamiliarity with installed products and system usage; being unwilling to implement changes to improve processes; and ignoring or misunderstanding the real needs of end users. Presented here is a snapshot of a few ways to consider in making your document flow manageable, beneficial to end users, and cost effective to your organization. Typically either with the end users or established procedures is where managers can begin to address document management practices. This is a great opportunity and starting point to drill down on actual needs for an organization. The discovery phase could be considered one of the most important parts of the process if not the most important part of the process. However it’s surprising how many managers don’t make the time to dig deeper into the actual needs of their end users. This typically leads to configuring a document solution that only partially meets the needs of the end users. In the scenario that we’ll be using, as shown on the above diagram, we will be working with three different departments. Human Resources want to manage new applicant applications. The H.R. manager wants to be able to look up applications as job openings in the company become available. Accounting manager wants to make it easier for the A/P clerk to process incoming invoices by having the data in the accounting system. Warehouse manager wants to be able to track signed Bill of Lading (BOL) after the delivery drivers come back at the end of the day. Although we have three very different needs for each of the departments, they do have some commonality which we’ll use to leverage our solution and make managing the document process easier. We are going to use two components to provide each of the departments there own unique setup. The objective is to replace manual repetitive work done by people with machine driven processes. This will reduce the number of times that a worker will touch a document or have to key in data or have to shuffle paper around the office. From a technical managing point of view, we want to reduce and reuse the number of component being used to make it easier to manage the overall document management ecosystem. Once setup, we want the automation of repeated steps to process forward with as few human touch points as possible. First consider a document management system like iView from inFORM Decisions. This will handle each of the applications separately. We’ll be able to store each of the document images in their own unique directory and write the captured metadata into separate tables. We’ll use the metadata as index fields to look up the documents at a later time and to push/pull data into the different operational systems for the company like the company’s ERP system and Accounting system. Additionally, we’ll use the front end portal; iView Document Center, to manage access to specific document types. This will make it easy to assign users from each of the departments to their own specific documents keeping the segregation of documents and data separate between departments. Second is document capture system like iCapture that will monitor an entry point for your documents and automate the document capture process to your needs. In our case scenario we want to make it as easy as possible to manage the incoming documents for the technical manager administrating the complete document system and more importantly for the end users at each of the three departments. In our setup, we are going to have different table top scanners like the Fujitsu Fi series scanners in each of the departments. As each of the departments scan in their originating documents in the different geographical locations, the documents will get funneled into a central collection point. The collection point can be either a single folder or a group of separate folders for each of the documents. The capture software will automatically monitor the collection point for new documents to begin the capture process. Within the capture process we can apply Classification rules to identify each of the different types of documents. The classification step provides an important point in which we automate the separation of documents by identifying the documents at the entry point. This allows us to apply different handling rules for each of the different document types although all the documents arrive in a central collection spot. 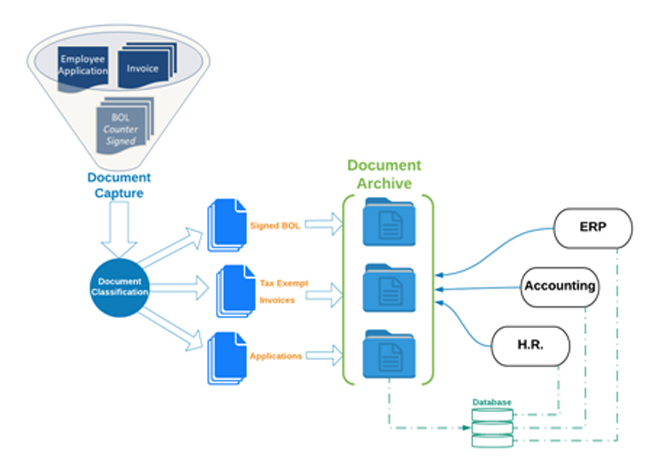 As each of the documents proceeds in the capture process, they each will follow their own unique configurations for indexing the metadata from the OCR process, validating the collected data, processing via Quality Assurance steps, and Migration steps. In our scenario, we are delivering the images of the captured documents into the iView Document Center and we are delivering the captured metadata into a database’s separate tables for each of the department’s unique systems. By now you must be saying to yourself… This is a simplistic view to a bigger solution… and you are right. My objective in this short article is to convey a few principles able to make your document import experience a successful journey. Take the time to really understand your document management needs. As managers of technology, operations, departments, and employee experiences it’s easy to become reactive as the pressures of demand push to get quick results. We’ve seen it over and over… those who engage deeper into the discovery of end user experiences and dive deeper into the overall needs of the organization tend to maximize their return in solution investments. From a technical managing point of view, keep your solution components to a few solutions that really provide you with what you really need and learn to use them. Learn to use your tools to take advantage of as many functions as they provide instead of adding another tool. Many times we run into folks that don’t realize that they have had the functionality in a current software tool they already own. If not sure, reach out to your contact for answers. This applies to putting together a document management system. Use tools that you can really use like iView from inFORM Decisions. Keep the continuity of steps understandable. When possible, use the same or similar steps in carrying your documents from the starting point to the end point. Have a central collection point to send documents into from all different locations in your organization; identify the documents using Classification configurations; process the documents with indexing and migration rules that are specific to a document type; and delivery useful data that is searchable to your end users. Keeping the flow of steps linear will make it easier for managing and troubleshooting your document management process. Times are always a changing. Always know that the best laid out plan will at some point change. In our modern world technology environments, regulations, and procedural shifts will at some point require your document management configurations to be altered. By having a sound laid out understanding of your document processing and of your tools like iCapture and iView, you will be able to better handle changes without having to reinvent your core document capture ecosystem. Contact us at inFORM Decisions to learn more about how we handle document management. These days, many organizations are seeking operation efficiencies, trying to improve productivity and stay ahead of their competition. The key to optimizing business processes is built around a digital document management system. 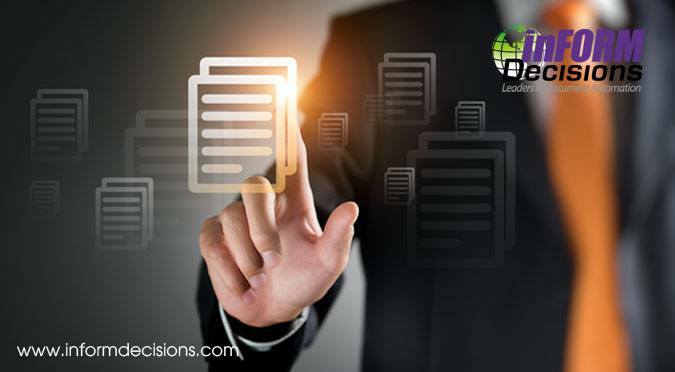 Finding a suitable document management solution is not merely a matter of researching options and purchasing a system. Finding one that doesn’t work as well as well as t was supposed to and then moving on to the next it why most projects fail. 1. The system doesn’t fully deliver. Maybe you were diligent in finding the best document management solution available. You got it all set up but aren’t seeing a return on your investment. . Often DMS digital tools don’t fully deliver because they don’t address the underlying questions of how the business stores and utilizes their information, or are not user-friendly. 2. Users haven’t bought into the solution. It’s unrealistic to expect your staff to embrace a system that is not intuitive and requires a ton of manual work. The point of your document management system is to avoid time-consuming processes and inefficiencies. If document management is unpopular in your workplace, it’s time to take a hard look at your system. If your users—the ones who are responsible for the day-to-day interactions with the system—haven’t bought into it, carve out some time to educate them on the system. Moreover, explain how using it properly will make life easier for them. Remember, bad habits are difficult to overcome. 3. Your goals were not specific enough. Goals like a paperless office, or to lower your document processing expenses are great big-picture goals, but they’re not specific and measurable. Failing to have specific goals can ultimately lead to failure. Instead of generalized goals, set some benchmarks that you can track, Start small and set a goal date for fully implementing the solution in a specific department. Take the time to measure your results, so you know just how effective the solution is. If your staff sees impressive results, then move on to the next department. •	Implement the system in a single department of your organization. •	Monitor feedback from the staff and any concerns they may have. •	Make any necessary changes to the process to ensure maximum user adoption and satisfaction. •	Once that department is implemented and is proficient in using DMS, have them assist in educating the next department. Outline your goals and make periodic assessments to determine if the solution is working and whether you need to make any changes. Contact inFORM Decisions to learn more about user-friendly document management that offers a serious return on your investment. 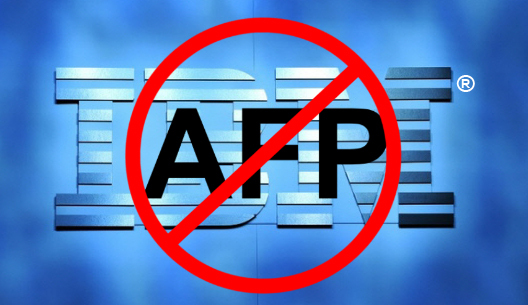 Last year it was announced that the 5770-AF1 IBM Advanced Function Printing Utilities will not be supported on IBM i V7R3 OS. While there is no indication that the AFP data stream and protocol are no longer supported, the AFP Utilities and the InfoPrint tool for designing pages will not be supported in V7R3. This would indicate that you can continue to print existing applications, but that you can not create a new form overlay or modify an existing one. A replacement for APF to consider is the acclaimed iDocs Forms Suite from inFORM Decisions. iDocsTM provides easy-to-use forms designer and spool file data mapper with menus to set up business rules for manual or automatic processing and intelligent distribution of merged, formatted reports, forms and security MICR checks. Print in color with graphics and bar codes. The snap-on Laser form printing module attaches to the iDocsTM Administrator to provide menus and business rules for defining dynamic, complex document printing operations on the IBM i. This solution is usable with all iSeries, System i and Power Server accounting/ERP solutions including JD Edwards, Mapics, Lawson, HTE, SAP, ORACLE, Computer Guidance, Optimum, Metalware, Pansophic, DCMS, PRMS, Infinium …any software application that generates a spool or XML file output. With iDocs, you can replace AFP while modernizing your documents and improving your workflow processes; distributing documents as PDF via email and fax, optionally archiving and importing them into a paperless Electronic Content Management system. inFORM Decisions has been a Document Automation provider specializing in state of the art Document Automation solutions for the IBM i – iSeries – AS/400 arena since 1994, we believe it is clear that the IBM i systems will be relevant for a long time offering the stability and security that you’ve come to expect from IBM i. inFORM Decisions is committed to the IBM i iSeries AS/400 platform forever! inFORM Decisions has been an IBM i (iSeries, AS/400) native, Document Management and Workflow software development company since 1994. Our business partners and customers are worldwide and lend testimony to the state of the art, stability of IFD solutions. Capture – the capture stage can mean different things for different processes. If you have a stack of paper invoices, and are looking to automated you AP process, obviously a scanner with document capture software would be key. But take a broader look, and capture can apply to other areas. Maybe you have an AS400 that prints POs? Implementing a spool to pdf solution would create digital files rather than paper. Another area might be inbound fax, or perhaps email with attachments. The overall goal of capture is to set a virtual perimeter around your organization that captures inbound documents and data, and passes them to a line of business system or a workflow process. Workflow – a business process management suite or workflow tool can provide a means to move documents and data throughout your organization. It can be fed information from any capture process, and provides the ability to avoid “efficiency killers” like the email inbox or file share. Take for example a hospital that has referrals faxed to a number, they are captured and passed to a queue for processing by staff. This digital process provides maximum efficiency, prevents lost or overlooked items, and with reporting tools, management can have great insight into the process. Archive – So what happens when it’s all over? In today’s environment, documents and data need to be readily available for review, audit purposes and legal needs. Both workflow and capture can provide an integration to repositories for storage of document and information. Take the fax process outlined above. The final step could be an archive of the inbound fax and metadata into a specific SharePoint library, or perhaps an OnBase document repository. The archive provides easy search for processed information, and create a digital file cabinet for your organization. As you evaluate your internal processes, and look to automate, make sure you approach all 3 stages of the document automation chain. BYOA: Build Your Own Apps for the IBM AS400 and DB2 – Webinar Recording -K2 Webinar by Stephen Boals of K2. With K2, companies have all the necessary tools to build no-code, powerful business apps that leverage IBM i and all of the other business systems throughout your organization. In this webinar, view a demonstration of how K2’s four-pillared approach integrates different business systems opening up access to data that is currently difficult to access. Learn about the new trend in Build Your Own apps and how it will help you improve efficiency and productivity. Contact us for more information on all these applications at 800-858-5544. Sunday, April 26 – Wednesday, April 29, 2015 10:00 AM – 11:00 AM MST COMMON – Annual Meeting & Exposition, Anaheim, CA. – Booth 114 Register here. April 26 – 29, 2015 – Disneyland® Resort in Anaheim, California. The Annual Meeting is COMMON’s largest educational event of the year, with four full days of in-depth IBM i, AIX, and Linux-related education that includes all-day pre-conference workshops, open labs and a wide variety of regular-length sessions. It is the annual meeting of the COMMON membership and the largest gathering of the Power Systems user community. It will kick-off with the Opening Session on Sunday, April 26, 2015, followed by four days of leading-edge IBM i, AIX, and Linux-related education, closing with the fun and exciting Closing Reception on Wednesday, April 29, 2015. Of course, as is expected from all COMMON conferences, there will be plenty of social and networking events taking place throughout the week. The Annual Meeting and Exposition is the premier educational and networking event that you and your team will not want to miss. Be sure to schedule time to browse the world’s largest Power Systems Exposition, encompassing over 80 exhibitors, including IBM. The COMMON Exposition provides a one-stop source of up-to-the minute information and ideas for the IT industry. Discover what’s new in the IBM i and AIX world and give your company ways to reduce costs and improve productivity. Also, since many different technologies are on display, you can compare alternatives and determine what’s right for you. There is still time to register and attend! Tuesday, April 21, 2015 10:00 AM – 11:00 AM MST -K2 Webinar by Stephen Boals of K2 – BYOA: Build Your Own Apps for the IBM AS400 and DB2, a Register here. -How K2’s patented data technology, SmartObjects, allows LOB integration across a variety of system, including IBM AS400 and DB2, with no code. -How K2’s browser-based forms, workflows and reports can provide powerful insight into DB2 data, and provide cross system applications. -An introduction into K2’s ability to replace legacy applications on Lotus Notes. Sign up today, as there are limited seats available. Rancho Santa Margarita, CA, February 5, 2015 – inFORM Decisions, a leading provider of IBM i document & payment automation solutions, announces iWorkflow, a document workflow solution to improve digital business processes. iWorkflow expands on inFORM’s document automation solutions to improve efficiency by offering a solution that allows users to electronically route internal or external documents, apply business rules, manage targets, analyze, annotate and approve reports and documents for paperless operational efficiency. Integrate with inFORM’s archive and retrieval solution, iView, to verify and approve documents before archival. Document workflows can be configured in a variety of ways to provide the flexibility to use the solution in a multitude of business processes. This includes launching the workflow process based on a predefined trigger from another source, such as from the IBM i, or from an external webform which can be triggered manually or automatically. With the iWorkflow webform functionality, companies can collect, display, interact, and prompt for user data which can be used within the workflow process. This information can be used to trigger other events, data knowledge for further steps in the workflow process, and general accumulation of information for process tracking and historical retrieval. Creating a workflow application is as easy as picking up items from the iWorkflow object’s pallet and snapping the objects together on the workflow canvas. Object configuration gives administrators a wide variety of flexibility to use iWorkflow in different scenarios within an organization’s business processes. “Document workflow solutions provide companies with significant labor and paper savings efficiency by taking the manual processes out of internal document routing and approvals. With iWorkflow, our range of document automation solutions handle the complete process of document management and automation,” says Dan Forster, President of inFORM Decisions, Inc.
For more information on iWorkflow and inFORM Decisions’ document automation solutions, contact inFORM Decisions at 800.858.5544. Visit www.informdecisions.com. inFORM Decisions (www.informdecisions.com) provides IBM i document management solutions to address the costs and inefficiencies of paper based business workflow. IFD solutions have been implemented worldwide in a multitude of open platform environments from small to Enterprise Fortune 100 sized organizations. inFORM’s paperless solutions include, forms scanning (capture), storage and workflow; variable data laser form merging and printing; laser MICR check printing and electronic payment solutions; and IBM i spool file report bursting, sorting distribution and management in various formats including Excel, PDF, Word, Text, XML, CSV and Zip formats. Please fill out this form to request a free demo or to connect with a sales representative.